Over 690,000 international students – about 3.6% of all US college students – are enrolled in degree programs in US colleges and universities. If you are considering studying in the USA, it is important to select an institution that meets your academic goals and financial budget. Here are a few factors to consider when choosing the right college. Academic study – One of your primary criteria for choosing the right school should be whether the school offers degree programs in your desired field of study – and ideally, is recognized as being a good school within that area. Geographic location – Where is the institution located? Is the institution in a small college town or in a major city? Is this somewhere you feel you’d be happy to live? Will you need some form of transportation (like a car) to get around? Academics – How many students are enrolled? How many international students? How many are studying in your chosen field? How is their reputation for the degree program you wish to enroll in? What do students say about the professors (Check out school-related internet forums or see RateMyProfessors.com)? 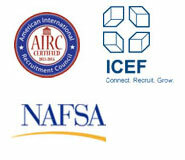 Accreditation – Are they accredited with a regional accrediting association or national agency? If not, be cautious. Expenses and financial aid – What is the total cost of all education, living and travel expenses if you attend? Are scholarships or financial aid available to international students? What housing options are available? Student life – What is the total cost of all education, living and travel expenses if you attend? Are scholarships or financial aid available to international students? Do they offer an orientation for international students? Do you have an idea of what campus life might be like? There is no “best school” out there. There are only schools that are the “right fit” for you. To figure out which institutions you should apply to, start with the basic questions: What do you want to study? What type of environment do you want to live in? What is my financial budget and what options do I have to pay for my academic study.